Here's Euphorbia portlandica, Portland Spurge. It's a relatively common, coastal plant found on sand dunes around the country, while being less common on the west coast. Tending to grow low across a dunes, the red stems are a diagnostic feature. It's a species in the genus Euphorbia, which contains 1603 species and belongs to the Euphorbiaceae family. The plants bloom from June to August (this photo was taken in late August at Cullenstown, Co. Wexford). The flowers are aranged as cymes - a more or less flat-topped flower-cluster. Don't confuse it with sea spurge (Euphorbia paralias) which is taller, with larger, less yellow flowers. The bracts of Portland Spurge (those modified leaves associated with the flower) are "ace of spades" shape with a tiny point at the end. Image: Courtesy of the Southern Star. Details below. I was delighted to take a trip to Liss Ard Estate, just outside Skibbereen, West Cork, yesterday to speak about the potato plant at a seminar organised by A Taste of West Cork Food Festival. The panel of speakers for the event included Regina Sexton of UCC, Madeline McKeever of Brown Envelope Seeds and Éanna ní Lamhna, author and RTE radio contributor. Éanna opened the evening with an informative and exciting summary of the history of the potato and its arrival in Ireland. This was followed by Regina Sexton's presentation on the potato as a food item amongst both the rich and poor in Ireland. Madeline McKeever spoke of her experience as an organic grower based in West Cork and about the interesting work done by the Sarvari Research Trust to breed blight-resistant potato varieties. My own talk centered on the historic and present-day impact of late blight on the potato crop and the recent advances in the science of the potato. I pointed out that an “arms race” now exists between the late blight-causing pathogen Phytophthora infestans and those who would seek to control it. The pathogen’s genome, its genetic blueprint, was sequenced in 2011 and this shows us that it is an incredibly flexible and rapidly-adapting organism. As we develop new fungicides or resistant potato varieties to control late blight, it is just a matter of time before Phytophthora infestans evolves to overcome these barriers. We have a number of options for the future including the development on new, blight-resistant potato varieties. These varieties can be developed via conventional breeding methods: for example, Teagasc developed the highly successful Rooster variety via its breeding programme and that potato now accounts for about 50% of all potatoes grown in Ireland. Unfortunately it’s not fully resistant to late blight. Resistant varieties do exist and they are often employed in an organic setting: sarpo mira, blue Danube, etc. However, consumers are reluctant to change from the traditional varieties. As expected the issue of the recent planting of GM blight-resistant potato plants in Ireland was raised by a number of audience members. I expressed my view that a small-scale, well-designed, open and honest experiment such as this, conducted by a well-respected public body such as Teagasc is to be welcomed. Opponents of GM often call for more information and more testing to be done on GM plants. This is exactly what the Teagasc experiment is designed to give us. We must use all the tools at our disposal: organic, conventional and GM to control late blight and protect the potato, a plant which has huge social, historical and economic importance for this country. The event concluded with a sampling of some delicious potato-based recipes (the lemon potato cake was particularly to my liking) as well as some gripping drama provided by the Skibbereen Theatre Society. 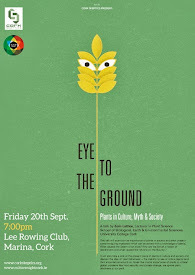 All in all, a wonderful celebration of the potato plant. 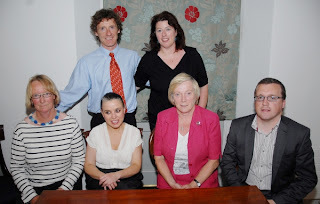 A Taste of West Cork Food Festival continues this week. More details of other events. Read the Irish Examiner's coverage of the event here. Here's a nice new animation from Nature and narrated by the excellent Tim Minchin looking at the history of genetics, the human genome and the ENCODE (Encyclopedia of DNA Elements) project - a project designed to identify and characterise 'functional elements' in the human genome. It's obviously very much oversimplified but is clever and charming nonetheless. 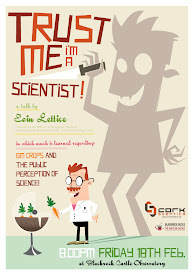 The wonderful I'm a Scientist, get me out of here (IAS) will take place, for the first time, in Ireland this Autumn. As I posted back in July, IAS will run in conjunction with Science Week and will consist of five zones where school-goers can ask scientists anything they like! It's been described as an 'X-Factor for scientists' and allows the sort of relaxed interaction between scientists and potential scientists that provides for a wonderful learning experience for everyone who takes part. Here's a 'before' post talking about what I wanted to achieve from participating. Here's a post detailing how it all worked and the types of questions I was asked. And finally, a post I wrote after I was booted out. A reflection on the whole event and it's value to student and scientists alike. 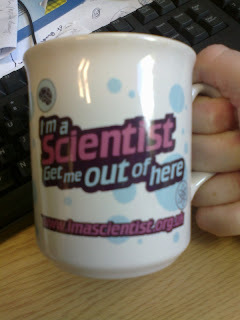 I really enjoyed taking part in IAS and it gave me a view of science outreach that I hadn't had before. If you're interested in taking part, I can highly recommend it. 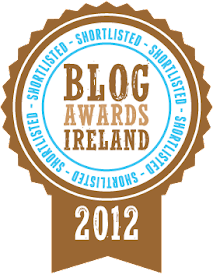 Find out more information on the IAS Ireland website. According to a couple of recent news stories, organic food is no better for you or the environment than conventionally farmed food. While growers and consumers would do well to take a closer look at the findings before making up their minds, the organic sector needs to turn to science if it is to remain relevant. 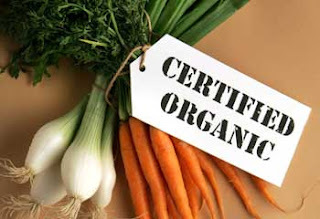 The big organic story of the week is a Stanford University meta-analysis which has variously been reported as showing that "Organic food no healthier" (Irish Times), "Why organic food may not be healthier for you" (NPR), and "Organic food is 'not healthier'" (Telegraph). According to the study published in Annals of Internal Medicine, there is little evidence from 237 existing studies that suggest organic foods are more nutritious than conventional alternatives. 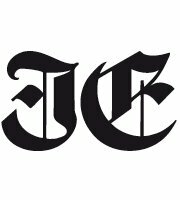 The authors do acknowledge that consumption of organic foods "can reduce the risk of pesticide exposure". Clearly the healthiness of a foodstuff is more than just its nutritional value, so the reduced pesticide use on organic foodstuffs is worth noting. “Some believe that organic food is always healthier and more nutritious,” said Crystal Smith-Spangler, co-author of the report. “We were a little surprised that we didn’t find that.” Perhaps they shouldn't have been given that a 2009 analysis of 50-years of research showed similar results. Some commentators have mentioned that they don't purchase organic because it is better for them, they shop organic because it is good for the environment. It seems, however, that this claim may not live up to further scrutiny. The second, and less widely reported organic story of the week is a study by Oxford University scientists which suggests that while organic farming is good for biodiversity, it does not necessarily have a lower impact on the environment than conventional food production. The Oxford study, published in the Journal of Environmental Management, is a meta-analysis of 71 peer-reviewed studies conducted in Europe. The authors report that "whilst organic farming almost always supports more biodiversity and generally has a positive wider environmental impact per unit of land, it does not necessarily have a positive impact per unit of production." The study showed that organic production generally needed less energy, but more land than the same amount of conventional produce. While biodiversity was 30% higher on organic farms, the production of organic milk, cereals and pork all generated more greenhouse gases than the conventional alternative. "Many people think that organic farming has intrinsically lower environmental impacts than conventional farming but the published literature tells us this is not the case," said Dr Hanna Tuomisto, who led the research at Oxford University's Wildlife Conservation Research Unit (WildCRU). "Whilst some organic farming practices do have less environmental impact than conventional ones, the published evidence suggests that others are actually worse for some aspects of the environment. People need to realise that an "organic" label is not a straightforward guarantee of the most environmentally-friendly product". an organic stamp should not be seen as the pinnacle of achievement in terms of sustainable food production What these two studies clearly show is that an organic stamp should not be seen as the pinnacle of achievement in terms of sustainable food production. On the other hand there are clearly some advantages of growing organically - increased biodiversity on farms and a decreased use and exposure to pesticides being just two highlighted in these studies. While these are positives, as conventional agriculture slowly moves away from the worst excesses of pesticide use, the importance of purely organic production may wane. I've long argued for a third way - an agricultural system based on science where what works and is safe from all systems of agriculture can be used together to get the best results for growers, consumers and the environment. If organic farming is to remain relevant in an era of growing food insecurity, it must be based on rigorous science and clear evidence. The organic sector must also begin to pick its battles. Organic is not the answer to all of the worlds problems. It does however have real contributions to make in terms of biodiversity and sustainable pest management.